NET SALES AREA 594 SQ. FT. GROUND FLOOR OFFICE 113 SQ. FT.
FIRST FLOOR OFFICE/STAFF ROOM 452 SQ. FT.
SECOND FLOOR ANCILIARY 296 SQ. 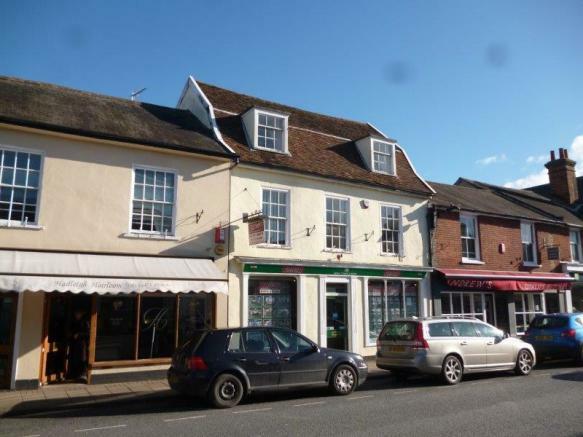 FT.
Prime retail/A2 premises with extensive glazed frontage in prime location opposite Adnams Cellar Kitchen Shop and close to the Co-Op Food Store. 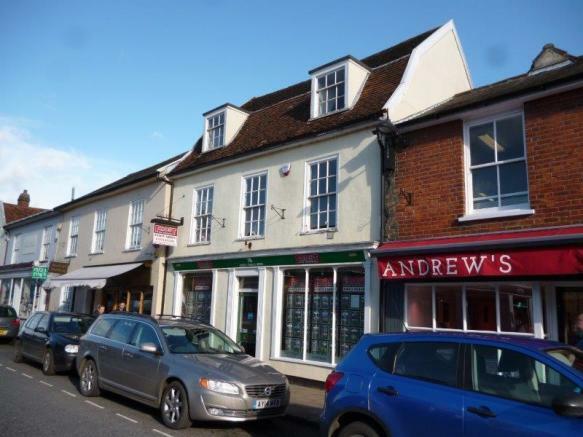 The premises occupy a prime location in the heart of Hadleigh High Street opposite Adnams Cellar Kitchen Shop and two doors away from the East of England Co-Op. Hadleigh High Street is renowned as being one of the most architecturally important High Streets in the country and supports a wide variety of mainly speciality local retailers and service occupiers mostly aimed towards the middle and upper markets. Morrisons have a large supermarket on the edge of town which opened some 7 years ago and the town also has a large and thriving industrial estate. Hadleigh has seen significant growth in recent years and such growth is continuing with McCarthy and Stone developing Tyefield Place and Manor Gardens combined scheme of 64 homes in the town centre and Persimmon Homes who have plans for a major development off Ipswich Road on the eastern outskirts of the town. Hadleigh itself has a resident population of around 10,000 but serves a much wider and affluent catchment area. The town is situated some 10 miles west of Ipswich, 13 miles east of Sudbury and some 15 miles north west of Colchester. The property comprises a fine period building which is listed as being of architectural of historic interest Grade II. The building is arranged over three floors and is constructed of a mixture of brick and traditional stud and plaster under a double pitched peg tiled roof. It has traded for many years as a residential estate agency but lends itself to a variety of alternative uses. The property has an extensive glazed frontage to the High Street and has rear vehicular access from Magdalen Road which leads to onsite private parking for 2/3 cars. The accommodation is arranged over 3 floors and has the benefit of gas fired central heating. Sales: frontage 24'4", builT depth 32'8". Sales are is subdivided into two main areas the front section measuring 24'4" x 14'1" and rear area 15'9" x 12'9" but which provides a total of some 594 sq. ft.
12'9" x 8'10" providing 1,113 sq. ft.
Office 1:	14'5" x 10'10" providing 156 sq. ft.
Office 2:	13'x 11'3" providing	143 sq. ft.
Staffroom:	11'9" x 13' providing 153 sq. ft.
Ladies and gents cloakrooms each with lobby leading to a w. c. with wash basin. Landing gives access to two further rooms each with dormer windows and measuring 15'10" x 11' and 13'4" x 9'10" providing a combined area of 296 sq. 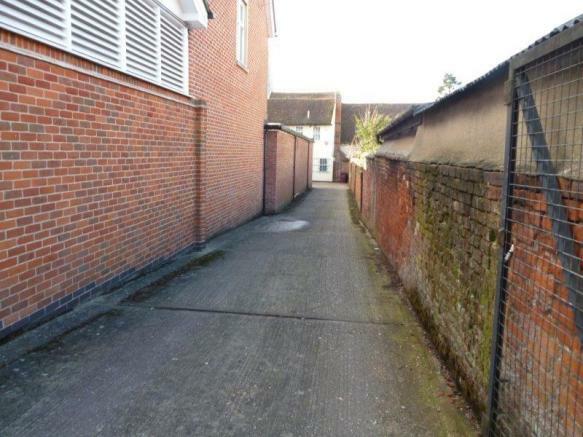 ft.
A concrete drive from Magdalen Road leads to an enclosed and secure private car parking area with space for 2 to 3 cars. Main water, drainage, electricity and gas are connected. The rateable value is £16,250. 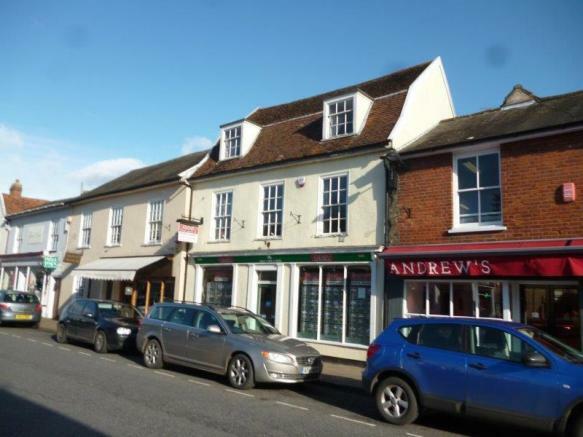 The property is available to let on a new lease for a minimum term of 5 years on standard full repairing and insuring terms. The property is not elected for VAT purposes. 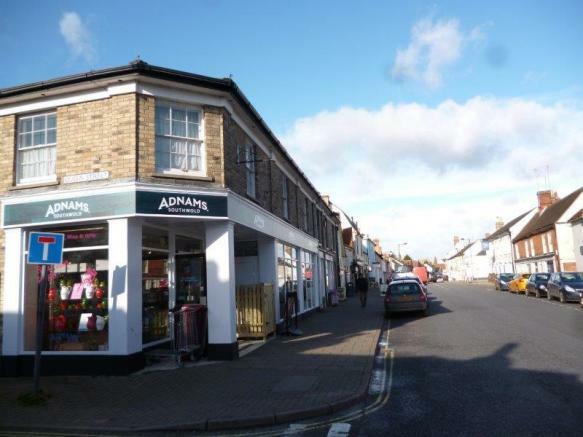 Property reference 76-High-Street-Hadleigh. The information displayed about this property comprises a property advertisement. Rightmove.co.uk makes no warranty as to the accuracy or completeness of the advertisement or any linked or associated information, and Rightmove has no control over the content. This property advertisement does not constitute property particulars. The information is provided and maintained by Birchall Steel Consultant Surveyors, Suffolk.